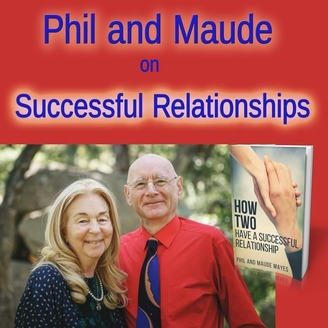 Each week this podcast talks about some aspect of personal relationships. 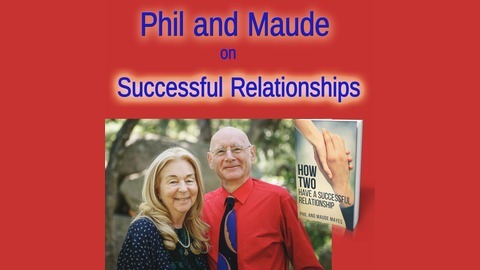 Phil and Maude believe that conflict-free relationships are possible for everyone, and talk about how they achieve that between them. MAUDE: I’ve been away for 5 days at a wonderful gathering with 30 women, called Sisters in Spirit. Just got back this morning, and Tuesday being our blog planning and forming day, Phil and I shared and looked at what is happening for both of us right now. In relating our experiences to each other, we were struck by a similar theme. We both had a really happy and full time without the other. Now this may seem to mean the opposite of what it does. No, we were not glad to be rid of each other! It’s just that our connection is deep and unruffled by either of us doing our own thing. Each of us was able to be fully present with the events and people we were with during our time apart. Both of us felt safe and secure – there was no sense of real separation. Our togetherness is not fueled by needs – neither of us is looking for the other to fill holes in our lives or our being. This kind of connection enables each of us as individuals to develop and prosper, and at the same time, feeds that energy right back into our relationship. It is indeed also important to nurture the relationship by spending time together and to create ever new shared experiences. As with most things, balance is the key. Relationships need attention, whether this be through exploring common interests or mutual adventuring. You cannot just put them on the back burner because things are going so well. At best, they will slowly turn into golden memories, but they won’t be replenished. At worst, you will lose contact with each other and that inevitably leads to misunderstandings and estrangements. And there we are with that grand old paradox again: the closer you are, the easier it is to spend time apart as individuals. 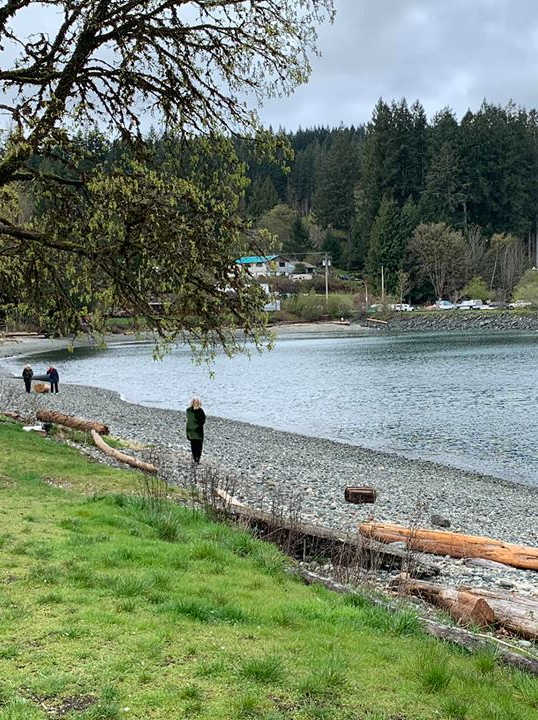 PHIL: Maude was away for 5 nights last week at a women’s retreat on a remote island off Vancouver, B.C. As for me, I used my new laptop to work every day on my political writing. I changed from using WriteMonkey to Scrivener. I recorded voiceover for a video about the Santa Barbara Courthouse Clock. I bought flowers at the farmers market. Delicious! I described this to Maude when she returned and she said hearing it made her happy because it meant that if she died first, I would be alright. I don’t know about that. There’s a big difference between leaving for 5 days and leaving forever. The longer we are together, the more she feels like that comfy spot on the sofa that seems to have molded itself to my body. Nonetheless, her point is not wrong. I have always had the exquisite sense that we are both complete already, and when we come together, we add to each other rather than completing each other. Earlier in my life, I was in a codependent relationship that felt completely the opposite; my role was to support, compliment, complement her. Everything I did was at risk of being wrong. This completeness means that with Maude, a separation like last week is so easy because there is no sense of loss, and because of that, there is no closing down and needing to open up again when we rejoin. We flow together and apart like water.